Wing span: 1 3/16 - 1 1/2 inches (3.1 - 3.9 cm). Identification: Variable. Wings orange-brown with dark markings. Underside of hindwing margin has thin white spots topped with brown; inwardly pointing triangles are black with little or no white areas. Median band pale yellow-brown to purple-brown with wavy, sometimes broken, black line. Life history: Males patrol during warm daytime hours along edges of bogs and in valleys. Females lay eggs singly on the lower surface of leaves of many different plants; caterpillars eat the leaves of their host plants. This species requires 2 years to mature in high elevations of Colorado, Alberta, and the arctic; newly-hatched caterpillars hibernate the first winter, fourth-stage caterpillars hibernate the second winter. In other locations newly-hatched caterpillars overwinter, then complete their development the following spring and summer. Flight: One brood from late June-August. Caterpillar hosts: Violets (Viola), scrub willows (Salix), and possibly blueberries (Vaccinium). Adult food: Nectar from goldenrods (Solidago graminifolia, S. rugosa, and S. squarrosa) and asters. Habitat: Taiga, tundra, alpine meadows and streamsides, acid bogs. Range: Holarctic. Alaska through most of Canada east to Labrador and south to the north Cascades, south through the Rocky Mountains to Utah and northern New Mexico; northern Minnesota, northern Maine, and the White Mountains of New Hampshire. Conservation: Not usually of concern, but colonies in New England are limited. Management needs: Monitor New England populations and recommend any necessary conservation steps. 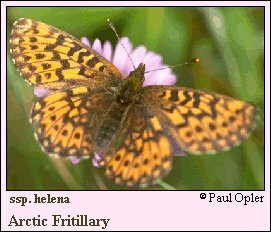 Comment: Previously referred to as Titania Fritillary (Boloria titania [Esper]), now considered to occur only in Eurasia.